Double X Science: As Seen on TV! Age Your Wine in 10 Seconds!!!! Anyone who watches TV, reads magazines, or flips through catalogs has seen some interesting products. Maybe they seem plausible to you, maybe they don't. However, a little investigation shows they are based less on science and well...actually working, and more on wishful thinking. At worst they're actual con-jobs, designed to separate you from your money as efficiently as possible (which I guess is a certain standard of success). As a result, we at Double X Science are starting a new series: “As Seen on TV!” In these features, we'll look at some of the products shilled on talk shows and infomercials, items lurking between the articles you read in magazines, or things you might find on the shelves of the stores where you shop. Our first entry is one I spotted in SkyMall, the catalog you (if you're like me) read if you forget to bring a book on an airplane. Where else can you find dog water bowls shaped like toilets or sports chairs built deliberately too large for anyone, so you look tiny sitting in them? While the catalog is full of impractical items (to put it mildly), some of them go beyond that into the realm of...imagination. Yeah, I'll call it that. It avoids potential lawsuits. It's the Aging Accelerator! With Magnets! Here's the idea: depending on which device you buy, you insert either a glass or a bottle of wine, and within 10 seconds! it ages the wine, with the unspoken assumption that this is desirable. (It also evidently works for whiskey, but I'll skip that discussion in the current article.) Now, anything that promises to drastically alter something within 10 seconds! is probably suspicious to begin with, but that's the part I'm going to leave alone. After all, magnets do work quickly, so if the device does what it claims to do, it's quite possible that 10 seconds will be enough time for the magic to happen. Well, it seems like magic to me. I went to a winery last weekend, and spoke to one of the vintners there (yup, that's the name for 'em). She told me that not all wines should be aged, and the reason has to do both with the way wine is made and how it is stored. First, not all wine should be aged! All wines actually go bad over time, including many of the usual types you may see in the store. That time may be pretty long, but you don't want to just buy any bottle, stick it in your basement, and wait 20 years to drink it – most of them won't taste good. According to my source, the days are gone where you might buy bottles of wine and put them in a cellar for your children. (Who has a wine cellar now anyway? I live in a second-floor apartment!) 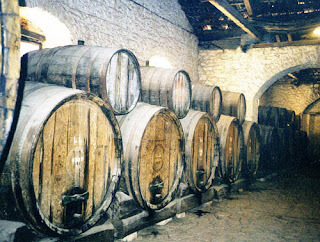 Basically, my source tells me to ask an expert if you have any doubts, but basically all wine is sold today in a drinkable state – no aging is necessary or even wanted. (I can't endorse it, but Wikipedia has a list of wines that can be aged, and possible ranges.) Earth's magnetic field has nothing to do with the aging process, whatever the ad says. Second, the reason some wines age better than others has to do with their chemistry: how much sugar is in the grapes and how much tannin content they have. Red wines typically are higher in tannins because the skins are thrown in with the flesh of the fruit – and tannins act as a preservative. Sugar also acts as a preservative, but it's not as effective, so white wines (lower in tannins, higher in sugar) don't keep as well. The point I'm trying to make is that wine aging isn't mysterious, either why it happens or how. 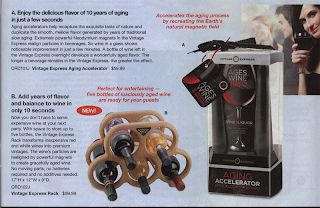 I don't have the “Aging Accelerator” package in front of me, so I can't tell you if they give advice on which wines to put in it and which ones to avoid, but the picture shows both reds and whites. So let's turn to the way the device is supposed to work: magnetism. They certainly have one thing right: neodymium magnets are very strong! (Neodymium is one of the “rare earth” elements, found near the bottom of the periodic table, so sometimes you'll see them referred to as “rare earth magnets”.) When I've used neodymium magnets for various experiments, two of them attracting each other pinched my fingers hard enough to create blood blisters. Admittedly magnets can seem mysterious: understanding exactly how they work requires looking at electrons and atoms, which might seem a little out of the ordinary. However, challenging isn't the same thing as magical, but some people seem to think that magnets are capable of all sorts of feats, from curing arthritis to – yes – aging wine. How magnets actually work could be the topic of an “Everyday Science” post, but in brief: the way a material responds to a magnet is called its magnetic susceptibility. Some materials, like neodymium, are very susceptible, but most things aren't, including the human body. (Some organisms such as pigeons use Earth's magnetic field to navigate, but exactly how they do it is still not known.) I couldn't find any particular data on the magnetic susceptibility of tannins or other molecules in wine, but my feeling is it's not large. 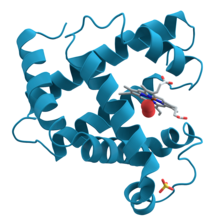 Tannins are big biological molecules – think DNA or proteins – and those don't tend to be magnetic. But here's the deal: suppose tannins are magnetic. Why then would exposing them to a magnetic field age the wine? Simply putting a strong magnet near your wine would merely rearrange the molecules inside the liquid – it's like stirring it, in other words. Obviously stirring something can change the way it tastes, since it can mix sediments in, but that's not the same thing as aging. 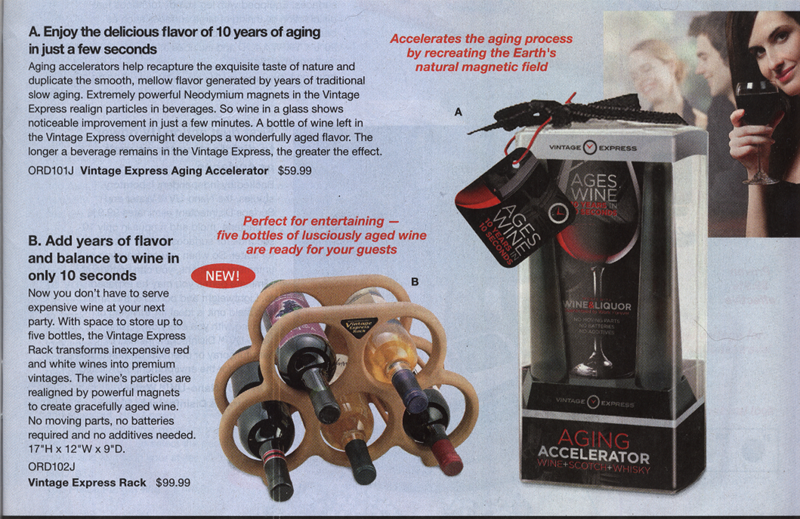 So, let's wrap up: why should we be suspicious of paying $60 or $100 for an “Aging Accelerator”? The concept misuses a well-understood physical principle – magnetism. Just because someone doesn't understand how it works doesn't mean it can perform miracles. 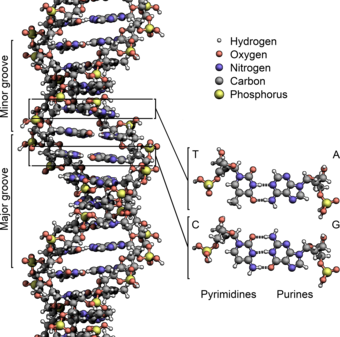 The aging process is chemical, and we understand how that works – it involves tannins, sugars, and other molecules. There are no secrets, in other words, and nothing simple to make your wine taste better. Basically, if it sounds like a magic trick, it probably is – but its main result will be to magic money out of your pocket. We'll see these kinds of rules repeated throughout the series!